Does this breakfast scream fall or what!? With all of the hullabaloo (fun word!) about pumpkin popping up around the blog world, apples, another autumn staple, sometimes fall to the wayside. 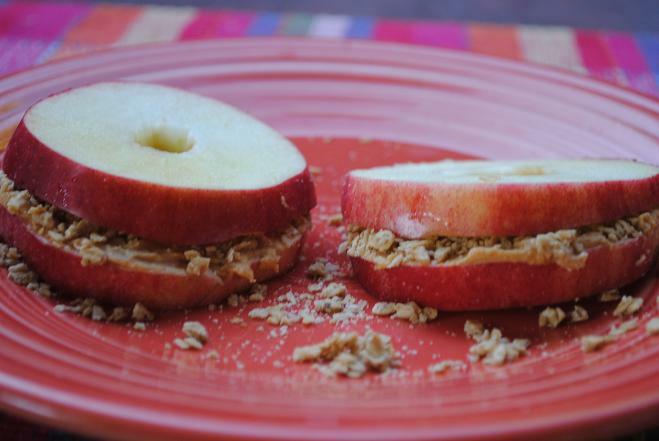 Last week my friend Betsy sent me a link to a recipe for apple sandwiches, featured on Whole Foods’ website. The minute I clicked the link I knew I had to recreate the fine lookin’ fruity sandwiches. Once I had several apple slices ready to go, I quickly ate all but four, because that’s all the recipe required and I was hangry! I then topped two apple slices with about a tablespoon of peanut butter each before sprinkling the nut butter with ginger granola that I purchased from Whole Foods last night. I topped the granola and peanut butter covered apple slice with the remaining nakie apple slice to seal the deal. She needed the extra fuel after our 2.5 mile walk this morning and I’m not about to deprive someone who craves a lil’ pb. That’s just evil. BodyPump, will you ever get old? I sure hope not because that class always is a good workout and makes me do exercises I despise but know are highly effective (squats, lunges). Now it’s time to get to work, my friends! Let’s start this week on a good note. Happy Monday! I can’t wait to make this as a snack!!! I need to get some of that ginger granola. I bet that really makes it! 🙂 Gorgeous. it really did. it’s such a unique flavor! i love it! Yum yum. That may be a snack this week for me! that apple sandwich looks delicious! I will definitely be making that at some point today!!! I imagine it would be delicious if you microwaved it for a minute or so to soften the apple- yum! 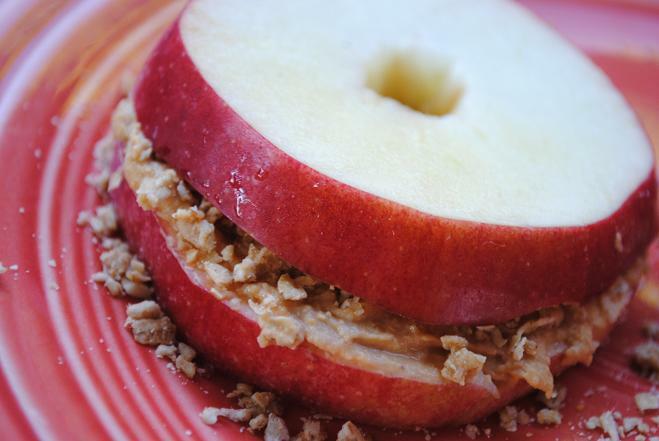 Ooo very creative apple sandwich! I was just thinking of putting granola in a sandwich thin. That look so yummy and filling – a great post-workout food! Can’t wait to try it! Yum– this is definitely the perfect fall breakfast! That apple sandwich literally made me smile. What a great snack! Thanks for sharing! seriously how much more creative could you get?! this is such a cute idea! LOL I agree w/ Kristy–for some reason this made me smile! It would be real good w/ some cottage cheese or greek yog on top on one side and PB on the other…if ya like that sorta thing. That’s such a good idea!! 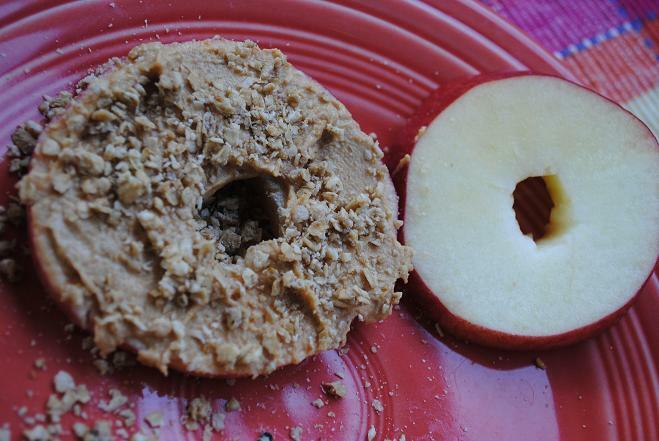 Reminds me of the PB/Apple “cupcakes” on Oh She Glows awhile back. What a great fall breakfast/snack! Hope you have a great start to your week! Holy Moly that looks good. I cannot wait to go apple picking to get some delicious apples. OMG … I follow Whole Recipes on Twitter. How did I miss this one? Looks delicious. And the Honeycrisp apples are back … perfection. Yum, that looks like the perfect fall breakfast! My favorite apple sandwich involves a bagel, apple slices, and cheese… served open face and toasted slightly so the cheese melts into all the crevices. Sounds strange, but is SO delicious 🙂 A childhood favorite. Wow! That apple sandwich looks so good! I’m going to try that! I’m so excited to try this one out! I attend a similar fitness class called Sleek and Strong, and it never ever gets old. I love it! I always leave the class feeling like I had a great workout! Those look absolutely amazing!!! I think I might sprinkle a bit of cinnamon on top to give it that extra “Fall is here” feeling! This looks pretty darn good! I will have to try it myself! This looks yummy – a nice inside out version of a typical sandwich. I love, love, love apples and the idea of using them as bread. 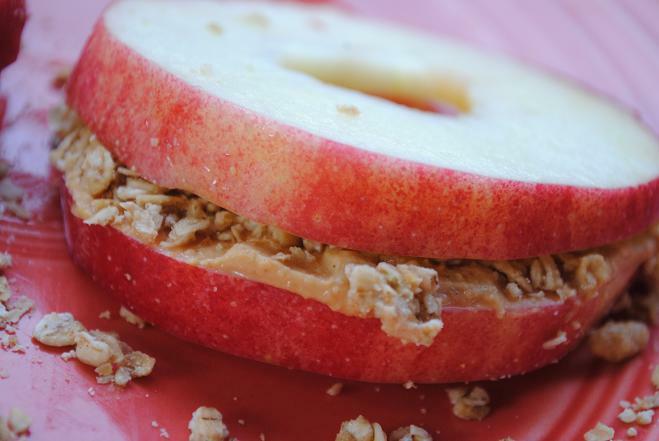 I love eating apples with peanut butter – this looks absolutely delicious! love that your post is different from pumpkin. I’m struggling to find pumpkin in my area so breaking it up and being different is key! Agh! I hate fall! It makes me crave apples like crazy and my stomach can’t digest them. That looks so good! Those apple sandwiches look awesome. I’ll have to try that. What a cute idea! 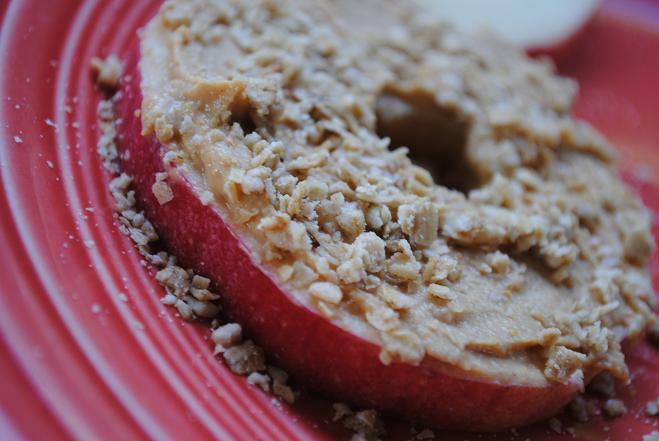 Apples are so yummy this time of year, and I bet it was amazing with the granola you just made. What a great idea…I am definitely trying this ASAP! Yum. This looks way good. Love fun ideas! Oh man Julie that looks absolutely amazing! I am going to try this for sure! I don’t think BodyPump will ever get old – loveee. 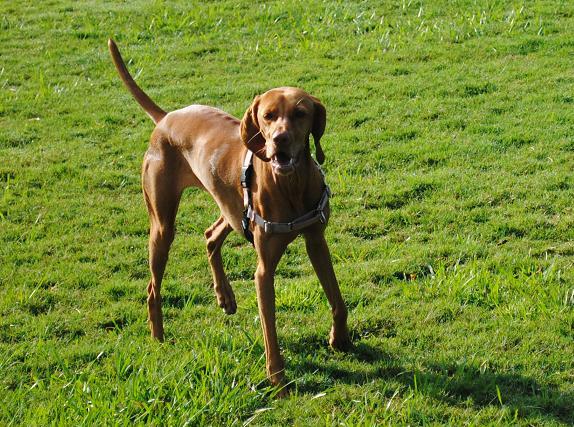 & I agree, the lunges are tough!